Bulletproof coffee is made with black coffee and butter. 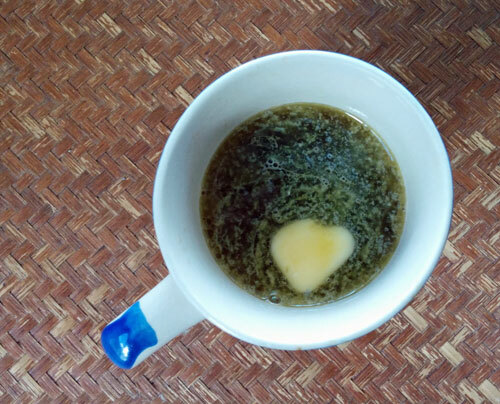 A cup of bulletproof coffee, butter included. I recently made myself some bulletproof coffee. If you’re not familiar with it, bulletproof coffee is basically black coffee with a surprisingly large piece of butter in it. The butter takes the place of the milk or cream one might normally use. The picture above makes it look even less appetizing than it actually is. After adding the butter I poured the coffee into a blender. 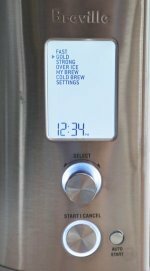 The blender whips it up and gives you a beverage that looks like coffee and cream. 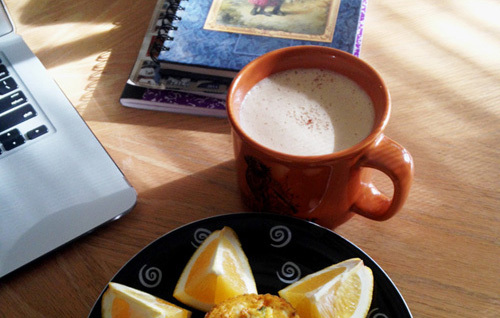 Some people – a few bulletproof coffee devotees – also like to add a little coconut oil. 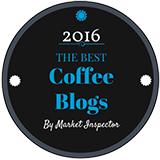 Well, if you are someone who really appreciates quality coffee – like I do - it tastes like a perfectly good cup of coffee that has been ruined beyond repair with a lump of butter. As for why someone would ever think of combining coffee and butter, that’s another story. According to an article I read in Fast Company magazine a fellow called Dave Asprey grew to like tea with butter when travelling in Tibet back in 2004. When he came back to the U.S. he tried butter in his coffee, and the rest is history. He has actually formed a coffee company that specializes in making bulletproof coffee, and apparently it’s doing really well. So...if adding butter, let alone coconut oil, to one’s coffee doesn’t make it taste better, why would you do it? It seems there are health benefits. I know, it sounds a little counter-intuitive. For a generation or so we have been told not to eat too much butter. But apparently it’s now the in thing. 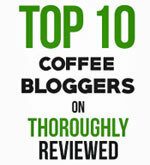 From what I understand, bulletproof coffee is meant to improve your cognitive function. Also, in spite of the high calories count, there are claims that it helps with weight loss. I know, it all sounds nuts. At least, it does to me. It sounds like just another health fad. Last year it was Swiss Chard that would miraculously improve your health. This year it’s bulletproof coffee. Next year, who knows? I have read a fair bit on the subject, and some people clearly like the taste. Or perhaps they are persuaded by the apparent health benefits to the point where a rather greasy cup of coffee actually tastes good to them. Far be it from me to judge. But one thing I will say is that if you buy quality coffee beans, and then go to the trouble of grinding them and brewing them carefully, and really appreciate the taste of the coffee you have made...don’t spoil it all by adding a chunk of butter. By the way, if you insist on trying this, be sure to use a butter that is without salt. The one I used was also organic. Apparently, if you really want to do it right, the cows should be grass-fed and not grain-fed. 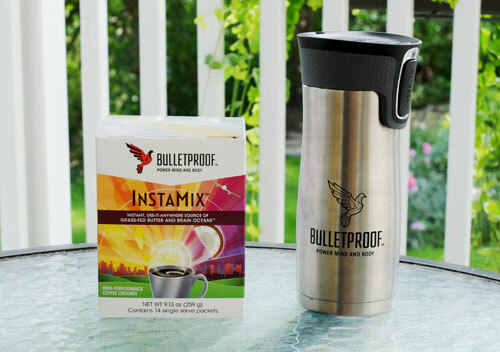 All that said, some people love Bulletproof coffee and make it part of a healthy breakfast. If you don't want to buy your own butter, and get out your mixer each morning, you can now buy sachets of Bulletproof InstaMix.